So I’ve been on a bit of a golf shoe buying frenzy of late. Two pairs in less than a month. If you say that is excessive, well, I’m not going to argue with you. Considering that I blogged about my quest to find some new golf shoes earlier this year, I figured it was time to update. 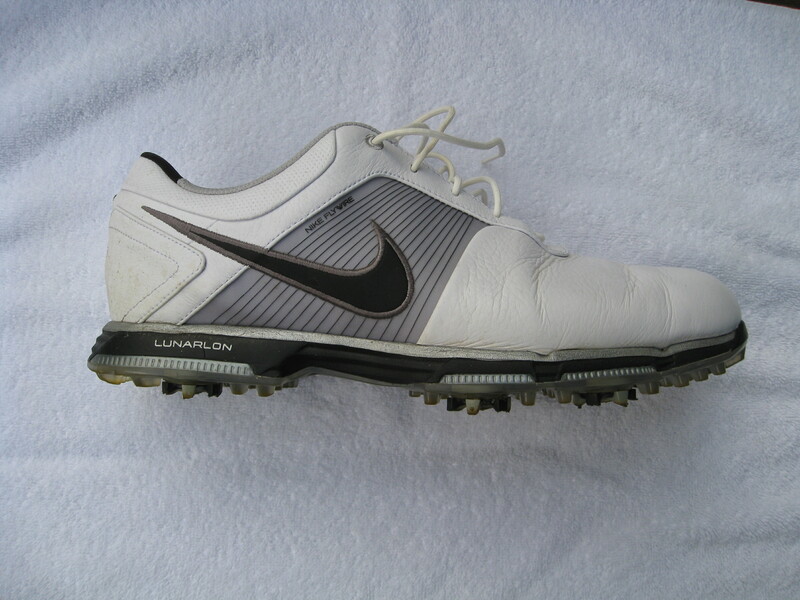 Initial thoughts: I had never had Nike golf shoes in the past, but had read many good things about this model. I have probably worn these for five walking rounds so far and the early reviews are very good. They are extremely comfortable. They are more comfortable than either my adidas Tour 360 3.0s or Powerband 3.0s. Plus they look very good with shorts. Initial thoughts: Yes, I finally broke down and bought a pair of Trues. They were on the steps when I arrived home from work on Tuesday. I’ve heard too many good things about these things from several blog readers (you know who you are). My concerns are how these spikeless shoes will perform when it is wet. 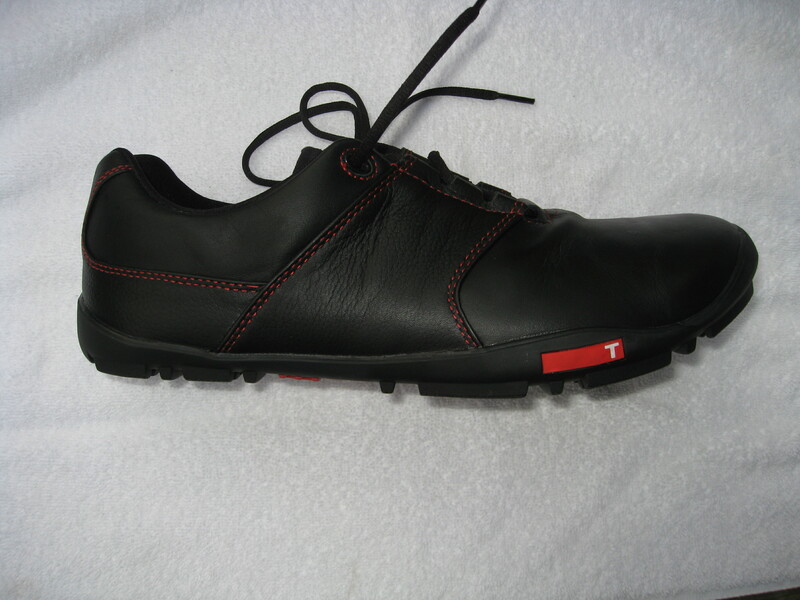 Prior to purchasing them, I stopped at Golfsmith on several occasions to try them on and walk around. They are very light, but they are going to take a little getting used to. The toe box is massive and it seems as if my heals sit lower than my toes. People say I will get used to both of those things. I ordered the shoes directly from True because I wanted to get a solid color pair instead of the saddles. I think the saddles — which was the only in-stock version at Golfsmith — look a little goofy. And since I’ve always been told that dark colors can be slimming (and since I just bought some white shoes), I went with the all black. I’m probably taking the Trues for an initial spin on Thursday after work. I will report back at some point in the very near future. They are certainly light and seem comfortable. If they end up being more comfortable than the Nikes, that will be an impressive feat and I will overlook the fact that they are a bit on the ugly side. I think maybe you need a 12-step (no pun intended) program of some kind. I’ve owned two pair of Nikes, years ago. Both were comfortable; neither had any staying power. I’ll be curious to see how Trues hold up. These Nikes seem pretty good. They appear to be the first ones that have really taken advantage of the technology they are using in running/basketball shoes. Hopefully they are good. Seem quite good so far. Simply put, you’ll love the TRUE’s. Super comfortable and the looks aren’t that bad once you get used to them. I played at Bandon with them in some of the worst weather imaginable and didn’t slip once. They are great shoes. I’m certainly anxious to give them a try. So do you ever wear shoes with spikes? Or are you Trues only? Like avonwalter said below, you can never have too many shoes. I have two or three pairs of regular soft-spike shoes but I’ve played maybe two or three rounds total this year without Trues. One can never have too many shoes. Words for Jeff to live by!